Metroplex Tech provides data, cable, video, phone and network wiring services for the entire Dallas Ft Worth DFW Metroplex. We offer complete commercial wiring for copper and fiber optic wired and cable installations. Audio Equipment – We offer quality wiring and built-in audio equipment from leading manufacturers. Security Systems – Complete security wiring and systems are available. UTP Patch Cables/Patch Cords - Unshielded Twisted Pair (UTP) Patch Cables and Patch Cords are used to connect two nearby components, such as a PC to a wall outlet, or a patch panel to a hub. Fiber Optic Patch Cables - Used to connect two nearby components with fiber connectors, these Cables transmit data with light, so you don't have to worry about electrical interference. UTP Horizontal Cables - These Cables are made from solid-conductor wires and typically used for in-wall premise installation. We provide high-quality Category 5e and Category 6 horizontal cables. High Performance Cable – We install high performance RG6quad shield coaxial cable for video and category 5e twisted 4 pair for phone and data. RJ45 Plugs - RJ45 Plugs are used to make UTP Patch Cables. We carry Plugs with both flat and round entrances, for making flat cables and rounded UTP cables. Jacks - We offer a vast selection of jacks, so you can complete and customize your networking outlets. Patch Panels - We carry a variety of patch panels, featuring from 12 to 96 ports. We provide everything you need to set up a manual switching center for incoming and outgoing telecommunication and electronic lines. Distribution Center - This is the central hub where all cables originate. Wiring is installed in what is called a star configuration; with each location being independantly pulled from the DC to the outlet location. Racks & Cabinets - We offer a wide range of racks and enclosures to store, secure, and organize your data and voice equipment. They help ensure that your devices run effectively and efficiently. 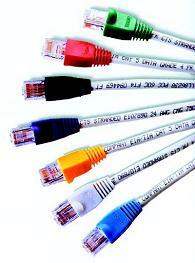 Cable Management - We provide various types of cable Management. From a 19-inch rack-mountable panel for racks and cabinets, to simple cable ties, we have the best ways to keep your network organized and your cables optimally arranged. Our extensive line of tools includes everything you need to connect a high-performance network. Our Raceway systems protects and conceals networking cables while eliminating the need to run cables behind the wall. Outlets and Faceplates - Our outlets provide the perfect combination of insert and faceplate features. They are the hardware you need to interface patch and horizontal cables. Video Outlets – TVs, VCRs, video disc players and other devices are supported and are capable of receiving cable TV, satellite and antenna signals. Modulation and distribution is simplified. Telephone Outlets – Each outlet uses RJ45 jacks and are designed to accommodate up to 4 phone lines. Home Office Outlets – These outlets accommodate phone, fax and high speed data connections. Media Center Outlets – These include a video source outlet combined with a telephone outlet and other audio connections. It provides a smarter way to entertain, and can tie into your audio system with the proper components.